The new EVS 1500, 8k and 10k Solder Recovery Systems recover on average 50-75% of Solder from your Dross. This equates to a reduction in your solder usage of up to 50% for the same amount of Production. All models have both LEAD and LEAD FREE VERSIONS. Rapid Payback is often achieved on purchase price within months. 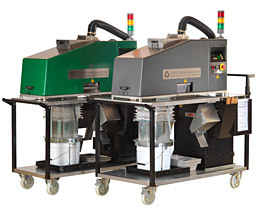 Self contained process avoids excessive handling of heavy, dirty, contaminated solder dross. Reduces storage and halves de-drossing time. Speeds up wave downtime as EVS Solder Recovery System enables you to dedross faster and more efficiently. Our Solder Recovery video is available for you to view online Windows Media Player Format. EVS International, the leader in solder recovery, today announced plans to exhibit in Hall A4, Booth 141 at productronica 2017, scheduled to take place Nov. 14 – 17, 2017 at the Messe München in Germany. The team at EVS is excited to unveil the enhanced EVS 500LFCab Solder Recovery System. After taking into consideration valued feedback from customers, EVS has developed a new addition of an integrated cabinet that the EVS500 will sit on. The addition of the cabinet combines an automated dross chute with a compartment for the storage of recovered solder bars. The automated dross chute will provide improved performance plus a significant reduction in dross handling for the operator. The EVS500LFCab is designed to ensure that the maximum recovery is maintained throughout the life of the wave solder system. Users can quickly recover up to 80 percent of pure solder with a higher ROI from the waste dross. EVS has continually improved the performance of the units and the new EVS 500LFCab is no exception. The EVS 500LFCab is perfect for customers with one lead wave and one lead-free wave; the customer who uses Nitrogen or wants to reduce their Nitrogen usage; the customer with selective solder pots who only removes small amounts of dross every hour; or the customer with multiple waves where one EVS 500LFCab is connected to each wave. Any size company can enjoy the savings that EVS solder recovery systems can offer. For more information about EVS International’s industry-leading systems, visit www.solderrecovery.com. The EVS 8KLF offers a capacity of 6kg/12lbs. Its integrated hopper makes rapid transfer of dross simpler and safer, and speeds de-drossing times by up to 75 percent. This provides a cleaner wave with less maintenance, less downtime and a reduction in shorts and bridging, as well as the potential to discontinue the use of messy wave oils and/or dross reduction powders.